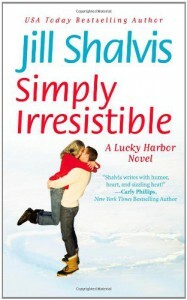 This is the first Jill Shalvis book that I've read and I can't wait to read more! Well-written romance with believable and relatable characters is always difficult to find but Shalvis does a fantastic job of achieving this.And while I loved the romance between Maddie and Jax (by the way, where can I find a Jax? Because I want one. ), I also loved many other elements of the story. I grew up in a small town and I certainly found myself sympathizing with Maddie and Jax concerning the gossip-mill that is Lucky Harbour. And I also appreciated the dynamic that existed between the sisters. Family is always a messy affair and I was glad to see that Shalvis did not try to make the turbulent relationship between Maddie, Tara, and Chloe all rainbows and sunshine. I loved Simply Irresistible and can't wait to read more about Lucky Harbour and the hot men who call it home!